Articles Are All Cat Breeders Created Equally? What do my kittens cost? "I have had this question come up many times and many times people are often surprised by the price. I am asking $1800 for each of my kittens (calicos, brown patched tabby, torties and dilute calicos will be $2200 due to the rarity of these colors). This includes a vet visit prior to going home with you, microchip, CFA registration papers, and first series of shots needed for their age, and my ongoing support as needed. If I am shipping a kitten to you within the US (no overseas shipping), you will be responsible for the cargo fare, airline approved crate, and any other needed vet visits, or requirements for your state and airline. I will not negotiate on the price of my kittens, as I dedicate 100 percent of my life outside of work to my cats and stand by 100 percent on the quality of my kittens and the care that they provide. 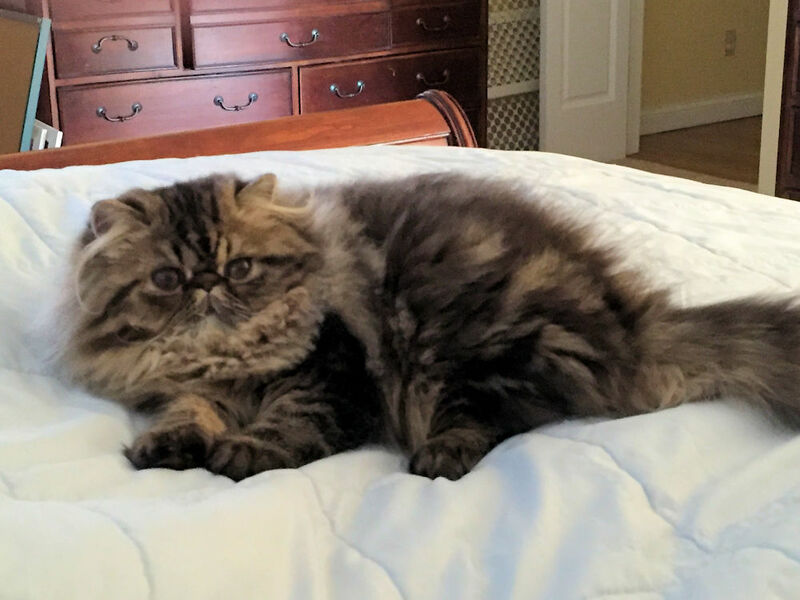 If you do a google search of Persian kittens you will see that reputable breeders and true pedigree Persians are all priced at the price of my kittens. I cannot post other catteries websites for you to view, but please visit CFA.org and click on the breeder list, this will give you a rough idea of what breeders charge for their kittens." "I don't understand why you are charging such high prices for these kittens. The parents are not titled .And since when has calico become a rare color?" ".... Anna is a DM! She is the mother of Rebecca....." (Rebecca is evidently his breeding female. This "breeder" does not show and has no intention of doing so. He is purely breeding cats and endangering his cats' lives in order to "make money". Well, when I REALLY looked at this person's Facebook page, it was evident this was his very first litter. While he may have owned Persians for many years, that does NOT make him a responsible and knowledgeable breeder. And, most importantly, why is he breeding? He is not showing his cats, or the parents of these kittens would have their own show titles, and he would not be bragging about the grandparents (and further back in the pedigree) are show-quality and titled animals as the reason he is asking the exorbitant price for his kittens. Does this person even understand the CFA Persian Breed Standard? Furthermore, calicos, patch tabbies, torties are NOT rare colors. To me, he is a newbie that is trying to align himself with long-time show breeders that have EARNED the right to charge higher prices because of the quality of their cats and their knowledge of the breed. No one starts out charging the highest price, they earn that right because of their years of experience, the titles they put on their cats (not some other breeder), the guarantee they provide, customer service and more. A show breeder always breeds to the CFA (or other registry's) Breed Standard. The goal of any show breeder is to improve and preserve the breed. Choosing to breed two cats is NOTabout profit. As long as I have been breeding dogs (over 20 years) and then breeding Persians (20+ years), I have ALWAYS shown them. What Does All This Mean to The Persian Kitten Buyer? Persian cat breeders (sometimes referred to as "hobby breeders" or "show breeders") are individuals who have devoted their time, financial resources, their homes, and have sacrificed time spent with their family and children for their love and devotion of the Persian cat through showing their cats, answering questions from people interested in Persians, and mentoring new Persian cat enthusiasts. They spend enormous amounts of money on purchasing the finest quality Persian cats, cat toys, food, vitamin/mineral supplements, enclosures, grooming products, vaccinations, veterinarian bills and other medical treatments, and much more. The hours spent bathing, grooming, traveling, packing their and their cats' belongings and grooming supplies, to attend cat shows whether locally or on a national scale are incalculable and not recouped through the breeding of their cats. Most show breeders are active (or members) in a cat registry (such as the Cat Fanciers Association), and may be a member of a local cat club. They take the time to educate themselves and to share their knowledge with others about Persian cats. A responsible breeder tests/screens their cats for known health problems in Persians (i.e., polycystic kidney disease - (PKD1) and HCM). to improve on a fault - but most importantly they always keep an eye on "the betterment of the breed." A breeder cannot achieve these goals without knowing their cats, the Persian breed standard, their cat's pedigree, and the health or genetic problems in their cat or its' ancestors. So, after reading the above "breeder's" post and justifications for why he is charging so much money for progeny of untitled cats, do you believe he is a responsible, knowledgeable, ethical, person interested in the Persian breed and bettering it? Or, is he interested in making money off the backs of these precious beings? Here is an example of what happens to the cats of backyard breeders (kitten mills) when the cats are sick or no longer of use. 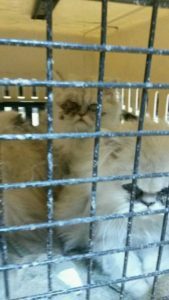 Three Silver Persian cats were dumped from a YELLOW HUMMER at an Applebees parking lot in Strongsville, Ohio last December 2015 by a woman (named withheld so I do not get sued). The "breeder" crammed all three sick Persians into ONE FILTHY CARRIER. One of the poor creatures had to be destroyed it was so sick. Unfortunately, by the time this matter came to trial (late November 2016), the Judge felt that while the witnesses saw a "tricked-out yellow hummer" driven by a "skinny blonde lady" it was not a POSITIVE enough identification so she was found NOT-GUILTY. I mean, how many skinny, blonde ladies drive a tricked out yellow Hummer and have a cattery breeding Silvers, Goldens and Chinchillas in Medina are there? Buyers Beware. Click here for more information on what makes a responsible and reputable Persian kitten breeder.